Hi Melissa! Wondering if you have ever used chilled herbal teas as the liquid ingredient in your smoothies? If so, did it work? 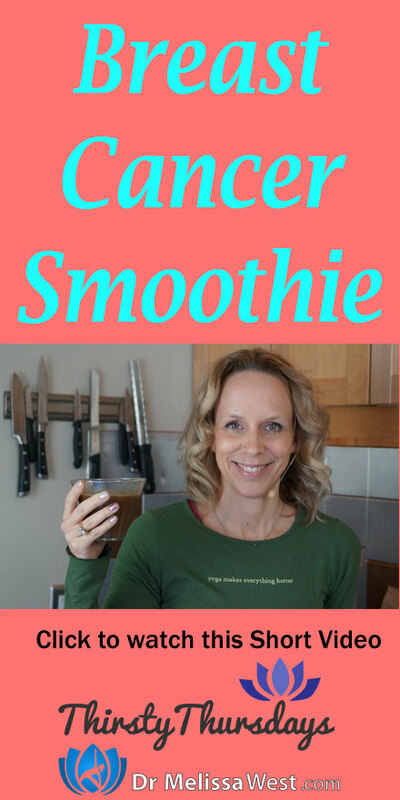 I am interested in a breast cancer smoothie for my friend and my favourite combo is spinach, apple, banana, lemon juice and add a greens powder. Astragalus has been shown to alleviate the adverse effects of steroids and chemotherapy on the immune system and can be used during traditional cancer treatment. It has been shown to fight cancer. Burdock Root is often used for skin issues, such as eczema and acne, however it can aso be used as a lymphatic cleanser which can definitely be an area of concern for people with breast cancer or in breast cancer recovery. Red Clover has been shown to prevent and counter breast cancer (Susun Weed) and it tastes like black tea. Fresh fruits and vegetables are fantastic for protecting against cancer. I am going to go for a cruciferous green in this smoothie such as one of the chinese cabbages like a baby bok choy or a baby shanghai bok choy. I am also going to choose low glycemic fruits to keep the sugars low. So cranberries, raspberries and strawberries. Some research shows that cancer feeds on sugar. sweeten with stevia if desired.